Nope, not the candy. I’m talking about a beauty product. This product has been on the market for years but only until recently has been mass produced by bargain hair salon companies and I’ve been waiting.When I was in high school, college and even in my early twenties, everyone I knew washed their hair every day. It was considered good hygiene. And I know from comments made by my fashionable grandmothers that this was stripped all of our hair from its own natural oils and drying it out. They only washed their hair once a week (in the bathroom sink as I well remember) and sometimes applied mayonnaise for conditioner! But simply washing my hair once a week would never been enough. With my blonde fine hair also comes a nasty little problem, grease. This isn’t the case for all blondes, but it certainly is common. So back in the day, I would try to go every other day without washing my hair, but it required hats, strategically placed headbands, sometimes even washing just my bangs to avoid the grease. So, for my Beauty Shop Saturday’s can’t live without product, let me introduce to you a little gem called- Dry Shampoo. My personal favorite comes in an aersol can (bad for the environment, good for my hair) because of its power. You can spray it directly on the roots, saving your ends from drying out, and it comes out evenly distributed. It also managed to give my fine limp hair some body. So even on days when I just need a little lift, it can really add some oomph The powder version is just as wonderful, but it takes a fine hairbrush and more patience in the morning than I’ve got. It has become so popular now that you can find this product at the Dollar General, yes it is truly easy enough to find in small town rural Midwestern towns. For only a few dollars you can have a day off from shampooing! My personal favorite is Suave’s Dry Shampoo. It’s cheap, it’s hard working and it’s accessible everywhere. (Am I talking about a dry shampoo or Pamela Anderson.) It retails for under $3 at Target. 1) It comes out white, so you folks blessed with beautiful dark tresses may have to either really brush to blend this in or be lucky enough not to need something like this in the first place. 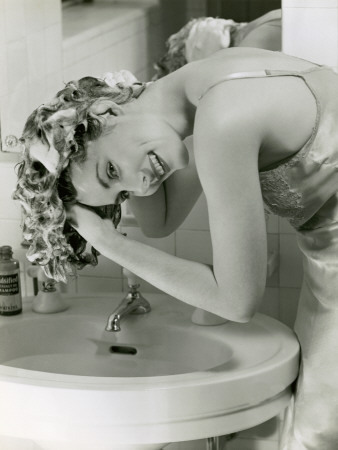 2) It can really dry out your scalp. It can make it a little itchy, so beware when wearing black. You may have a few flakes that can resemble dandruff that are really just the dry shampoo. 3) You may never be without this product again. It really is a lifesaver for me. And it has endless possibilities. Camping? Traveling to a third world country? Pack the dry shampoo. I promise it won’t disappoint. Here’s to a few days between washes for you!